Here’s a view of the back cover. I’ve confirmation the book is out and available in the US but not quite yet in the UK.. fingers crossed it’ll be out soon and we can see what the readers think! We’re off to Ennis, Ireland tomorrow. As a warm up for the Ennis Open GM Gawain Jones will do a simultaneous display in O Keeffes pub in Ennis on Thursday 19th May at 7.30pm. Most of you will know Gawain but for those of you who don’t, he is an English grandmaster, author and chess professional and is one of the top players in the UK at the moment. Gawain lived in Ennis for a number of years during which time he completed his Leaving Certificate at St. Flannans College and played for Ennis chess club helping us to 3 Munster League titles as well as qualification for the European Club Cup for the first time in the clubs history in 2005. 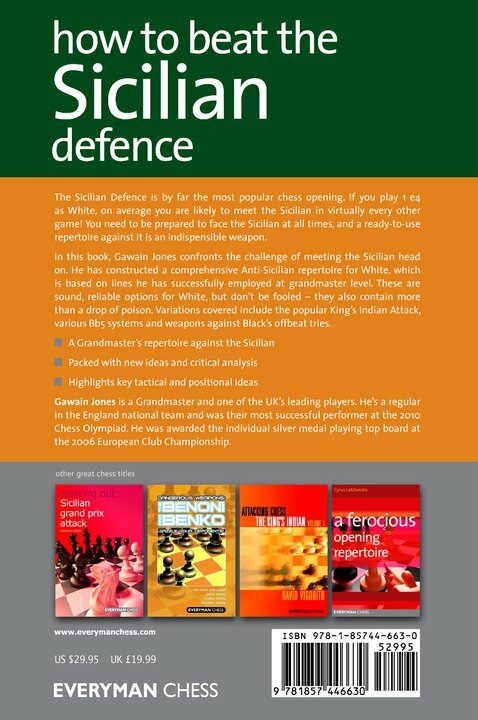 More recently Gawain has played for the English national team at various international events, including the Olympiad, as well as competing in individual events. His most recent success on Irish soil was winning the Bunratty Masters Championship in impressive style against strong opposition last February. Gawains chess style is combative and original and given that the event will have a fairly light hearted feel, it should be a good evenings entertainment. Even if you don’t plan playing you are more than welcome to come along and have a look at a Grandmaster in action. John Cassidy has said that the event will also include a lecture by GM Vlad Jianu from Romania afterward. GM Jianu has played in the Munster League and Club Championships for Adare this season and is also a strong GM. The entry fee to take part is €10 for juniors and €15 for adults or if you prefer you can just come along and have a look for free! Contact John Cassidy on 087- 2495913. Will update when I can!